PIMs can be structured in different ways. Some allow utilities to earn a share of the net benefits from efficiency investments and others provide a cash reward for meeting energy savings or other targets (called savings-based and multifactor incentives). Another type of incentive allows utilities to earn a rate of return on their efficiency spending as they would for investments in generation or transmission and distribution infrastructure (and these incentives can also be aligned with performance criteria). Since our last national review of performance incentives in 2015, we’ve seen a notable upward trend in both multifactor and rate of return incentives. The figure below shows the current landscape of utility energy efficiency PIMs. Four states have adopted rate of return performance incentives, up from one state in 2015. These mechanisms are growing in popularity because they allow a rate of return for demand-side investments in a manner similar to traditional infrastructure investments, which helps to level the playing field for energy efficiency. Rewards are sometimes based purely on spending, but they can also require performance criteria such as certain levels of energy savings. For utilities that are rapidly ramping up efficiency investments, like PSE&G, rate of return incentives can spread costs out over a longer time period rather than recover them within the year they are incurred. This smooths out the customer bill impacts of large investments and ensures that customers pay for efficiency measures over the many years of receiving their benefits. In 2016, Illinois set new efficiency targets for its investor-owned utilities. The legislation included performance-based rate of return incentives for meeting or exceeding the targets as well as penalties for not meeting them. The utilities can earn up to 200 basis points for exceeding their targets, or they can lose up to 200 basis points if they fail to meet them. 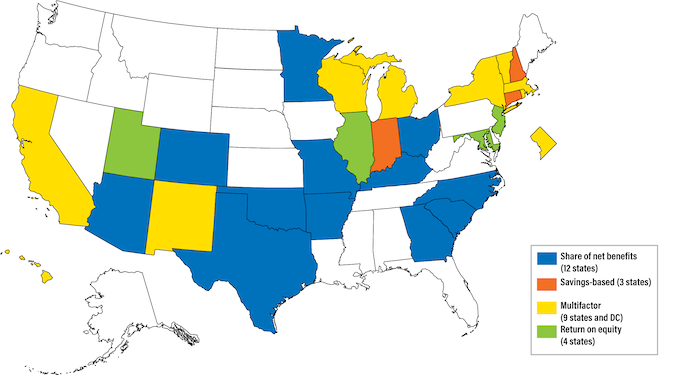 Beyond energy savings, states are increasingly working to meet new policy goals. These goals include reducing peak demand (and system costs), reducing greenhouse gas emissions, and creating savings particularly for low-income customers. To do so, states including Massachusetts, Rhode Island, Hawaii, and Michigan are using multifactor PIMs, which reward utilities for meeting multiple policy goals. Massachusetts recently put forth a new and aggressive energy efficiency plan that includes new PIM components. If approved by regulators, the state’s utilities will be able to earn rewards for achieving energy savings, pursuing demand benefits, and providing incentives to customers who rent, rather than own, their homes or apartments. These new incentives encourage program administrators to address multiple policy goals and to accomplish long-term climate goals. Other states, utilities, and regulators are also innovating to achieve their policy objectives. The rise of utility proceedings on utilities optimizing distributed energy resources, including energy efficiency, offers an opportunity to expand utility business model reform options that can support efficiency investment. The right incentives, including PIMs, can lead to increased procurement of non-traditional resources to address emerging system needs. Read our full topic brief to learn more about PIMs and other innovative performance incentives that are driving deep energy savings and helping to achieve multiple policy outcomes.